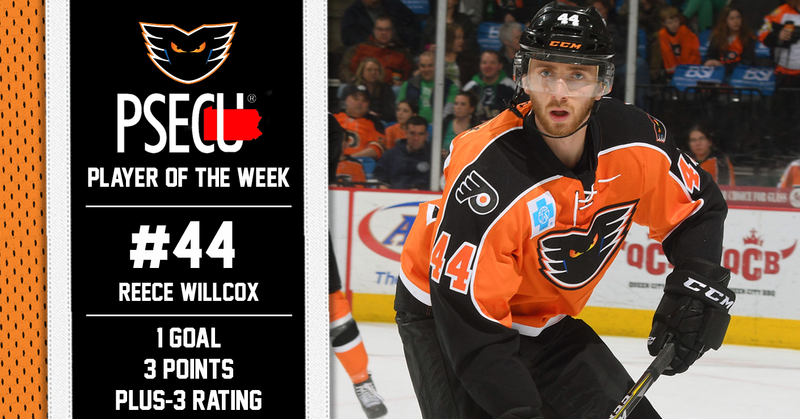 LEHIGH VALLEY — With a goal and two assists for three points as well as a plus-three rating in two games this past weekend, Lehigh Valley Phantoms defenseman Reece Willcox has been named the PSECU Player of the Week. With just two games left on the schedule — both of which were on home ice — during the 2017-18 season, the Lehigh Valley Phantoms looked to close out the season on a high note after winning the Atlantic Division Title. On Friday, the Bridgeport Sound Tigers were in town and Saturday saw the Phantoms take on the rival Wilkes-Barre/Scranton Penguins. Despite the Sound Tigers finding their way onto the board first in Friday night’s contest, the Phantoms battled back to tie it past the halfway point of the first period when Willcox fired a long-distance shot from the right point that deflected off of the right post and into the net. That sent Lehigh Valley into the locker room tied with the Sound Tigers at one goal apiece. With less than eight minutes remaining in the middle frame, Willcox again tee’d up a point shot that was deflected into the net by newcomer Isaac Ratcliffe. That would be the 19-year-old winger’s first professional goal in just his first professional game and Willcox’s second point of the night. Willcox also assisted on Mike Vecchione’s empty-netter late in the third period as the Phantoms went on to win the game 5-2 over Bridgeport. Friday’s game would mark Willcox’s second three-point, and fourth mulit-point, game of the season. At season’s end, Willcox had recorded 3 goals and 12 assists for 15 points across 57 games with the Phantoms this season.